This is Sir Alfred Gilbert's working model for the tomb of the Duke of Clarence in the Albert Memorial Chapel, St George's Windsor. The tomb, commissioned in 1892 shortly after the death of the Duke, was not finally completed until 1928. The finished monument differs considerably from this sketch-model. Sir Alfred Gilbert (1854-1934) was a famous British sculptor of the late 19th century. He was also medallist, goldsmith and draughtsman. He was known for his inventiveness and characteristically used many different materials in the same work. He epitomised the movement known as the “New Sculpture”, with a new focus on naturalistic forms. His many commissions included for example the celebrated figure of Eros, part of the Shaftsbury memorial. Sketch model in bronzed wax on a plaster base. 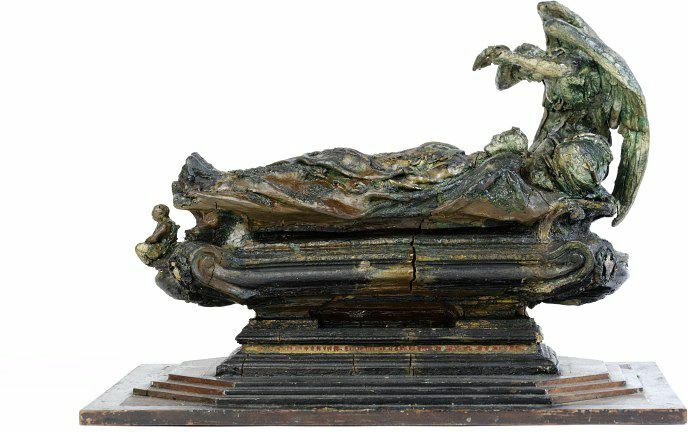 The Duke lies, in robes, on an elaborately moulded sarcophagus with an angel crouched at his head. On the foot of the sarcophagus is a small seated figure. In the studio of the sculptor at the time of his death. Given by Mr Sigismund Goetze and the National Art Collections Fund in 1936, together with cat. nos. with A.88-1936 and 90 to 99-1936. 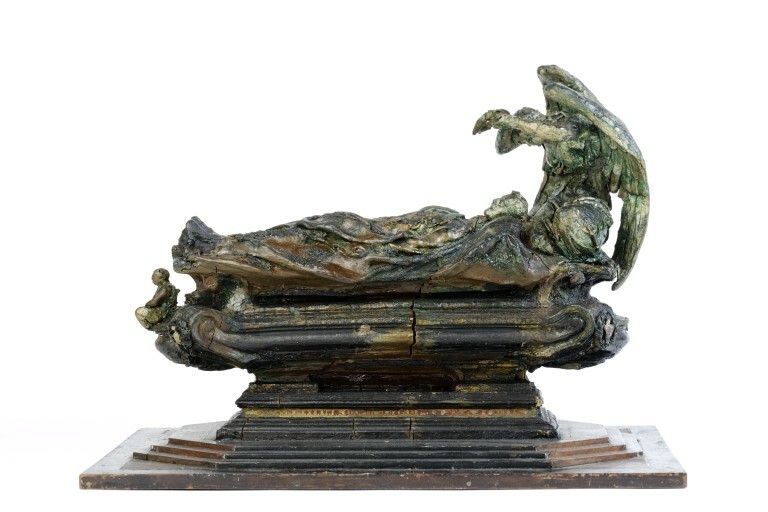 The commission for the tomb was given shortly after the Duke's death in 1892 and a sketch model was exhibited at the Royal Academy in 1894, but the work was not completed until after Gilbert's return to London in 1926.